Bordeaux is a very beautiful city with an abundance of impressive architecture and art work. Although the streets are generally narrow and there is not a lot of green between the buildings, the many charming plazas and street cafes enrich the city in their own way. 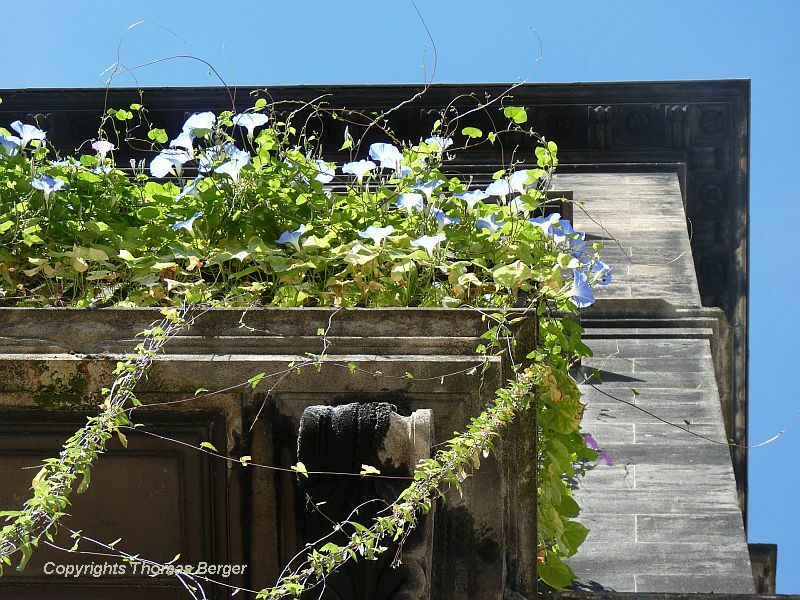 Houses in Bordeaux do not often have flower displays but occasionally one can find some creative plant displays, such as these 'Heavenly Blue' Morning Glories greening up a balcony (seen from below). However, artistically designed railings, often containing botanical patterns, are very abundant and one of the many gems of the city. I found two parks in Bordeaux that I needed to investigate - the older 'Jardin Publique' (Public Garden) and the more recently created 'Jardin Botanique' (Botanical Garden). 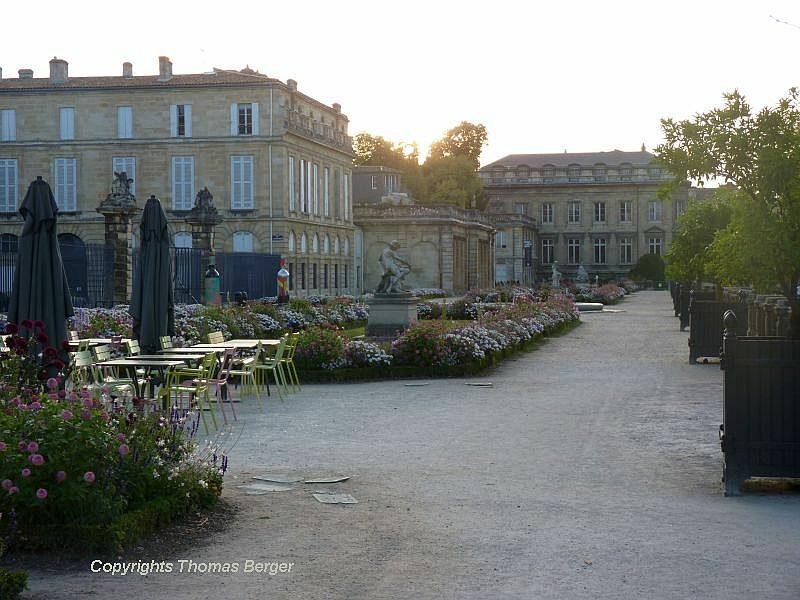 The 'Jardin Publique' of Bordeaux was inspired by humanistic ideals and was supposed to serve the public of Bordeaux as "a place of recreation and to stay healthy". It was originally created in the French style by the architect Ange-Jacques Gabriel around 1750, but one hundred years later, this 25-acres park was redesigned, according to the taste of the time, as an English Garden. In the Jardin Publique, a number of greenhouses were once connected to a centrally located building. Today, this is the dominant architectural element of the park and reflects beautifully in a wide pond. The back side is overgrown with Boston Ivy (Parthenocissus tricuspidata). Located within the Jardin Publique are charming terraces with sculptures, flower beds and a cafe. The building in the background, created in 1781, is the Museum of Natural History. The great charm of the Jardin Publique lies in its age, and as a consequence, in the maturity of its plants. Many of the trees are hundreds of years old. This old Swamp Cypress (Taxodium) has developed 'knees' - woody knobs protruding from the ground on the edge of the water. This is one of the largest Stone Pines (Pinus pinea) I have ever seen. 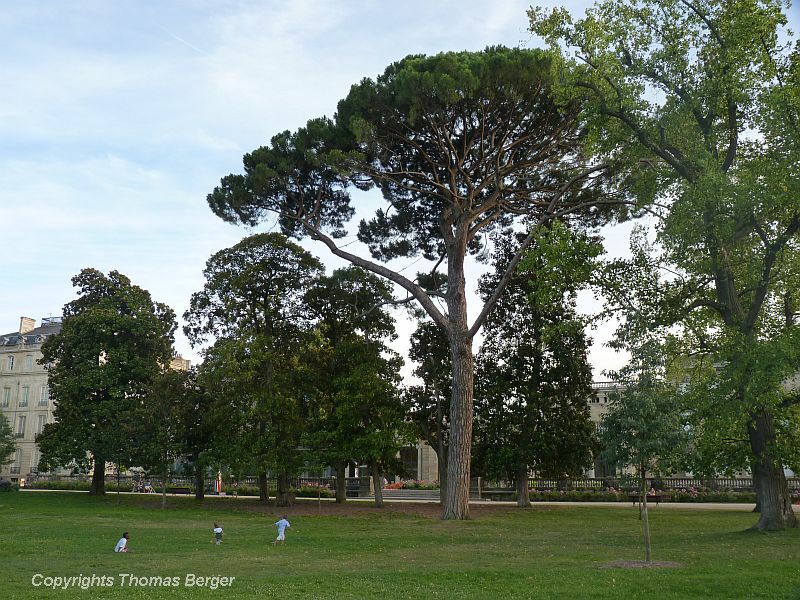 Since older specimens often display a distinctive umbrella shape, it is also often called Umbrella Pine (not to be confused with Japanese Umbrella Pine). This tree provides edible pine nuts. Unfortunately, it is threatened in many parts of its native range (the Mediterranean) by a bug that was accidentally introduced from North America. Magnolia grandiflora, the Southern Magnolia native to the south-eastern United States, is a spectacular evergreen tree. The thick, shiny foliage, fragrant white flowers, and unusual fruit caught the attention of European gardeners in the early 1700s, when it was first introduced to England and France. The specimen in the 'Jardin Publique' might be around 150 years old. Beautiful bright blue border-bearing Petunias. 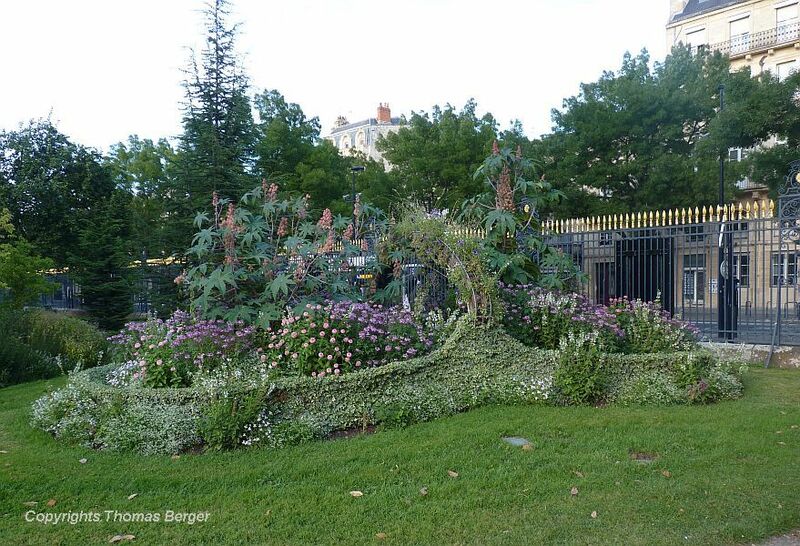 The 'green sculpture' is an annually changing creation near one of the entrances of the 'Jardin Publique'. This year it is a flower basket. The other large park, the 'Jardin Botanique' of Bordeaux, is entirely a modern creation. Clearly, there was good intentions to educate visitors about native plants as well as garden and farm crops, which were displayed in small fields and plots. However, many beds were poorly maintained and in some cases the weeds had all but overgrown the crops. 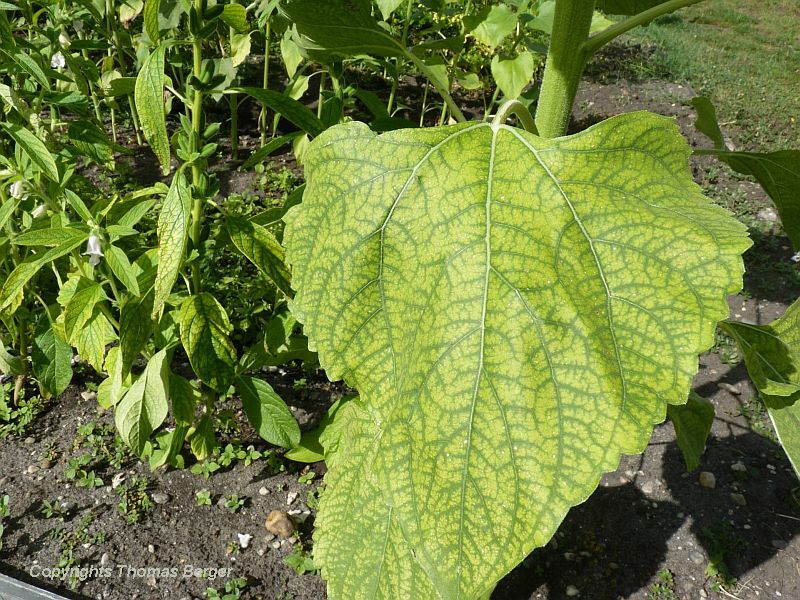 This leaf of a sunflower has severe symptoms of nutrient deficiency (chlorosis). 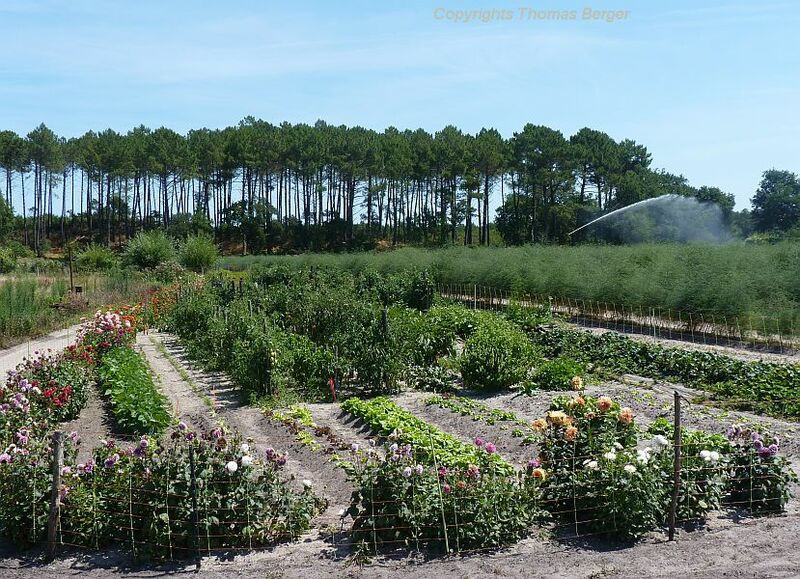 Many of the vegetables and farm crops grown in the botanical garden had deficiency symptoms to some degree. Why not apply some broad-range organic fertilizer and check the pH-value? A large pond within the Jardin Botanique contains a nice collection of water lilies and many other water-garden plants. 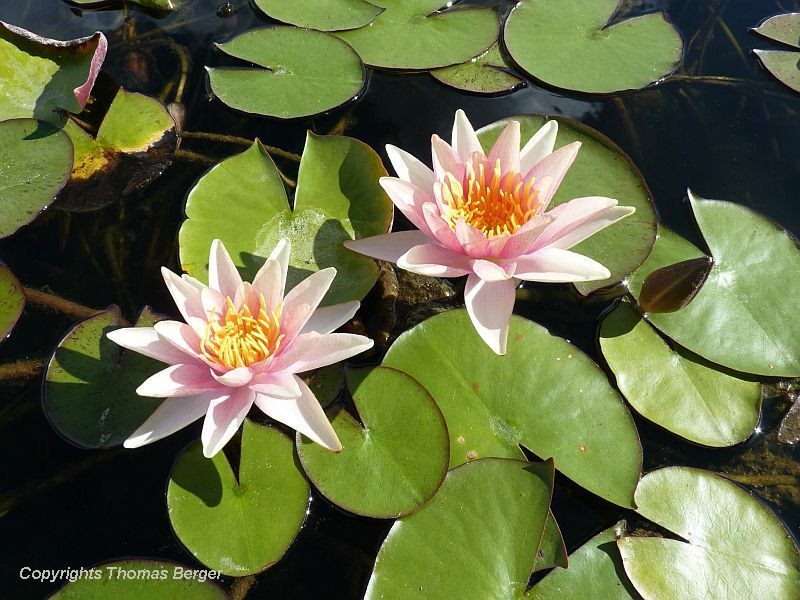 Seen here is waterlily 'Apache'. I was pleasantly surprised to find a small rice field in this park. 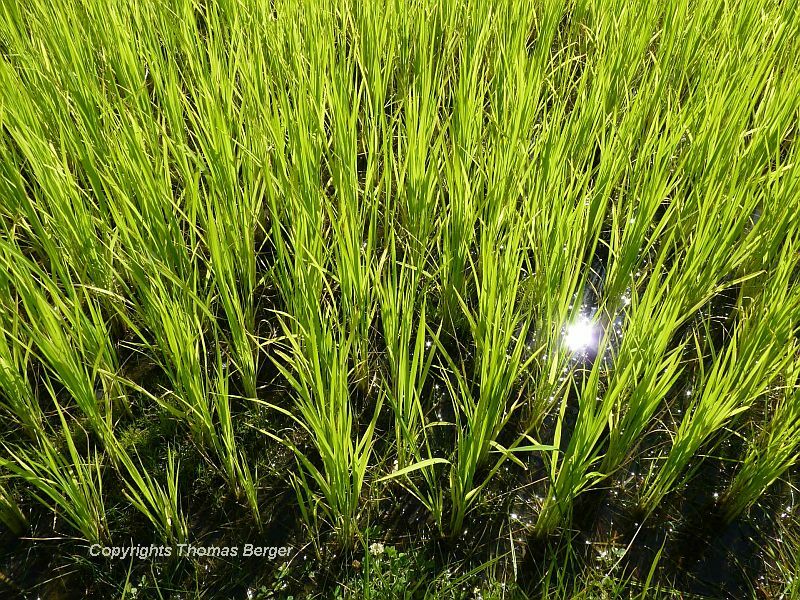 Most people know rice fields only from pictures, so this one provides an excellent educational opportunity. I was also delighted to find Sesame plants, which I grew in my garden during my time in Niger almost 30 years ago. This plant adapts to the hottest climates with ease. 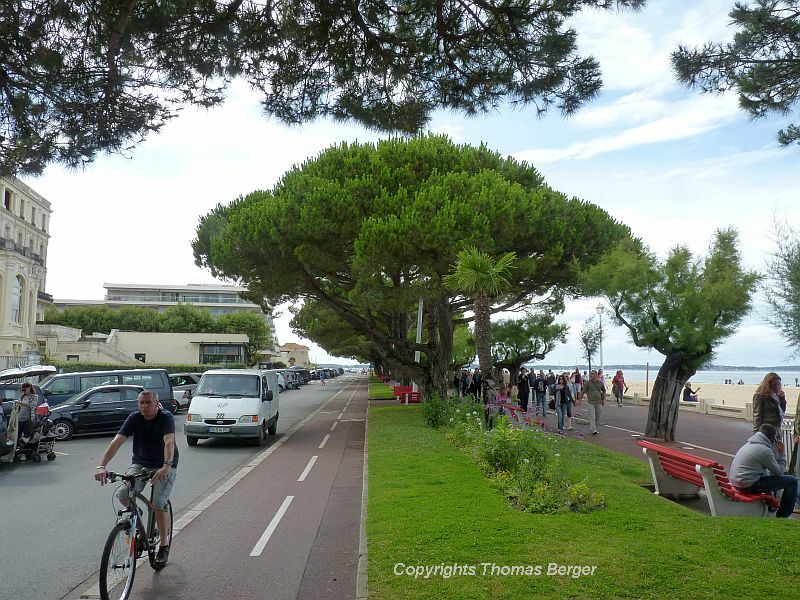 Umbrella Pines and Tamarisks are favorites in public spaces, such as here in Arcachon, a busy vacation resort on the ocean. The charming, Acacia-like Albizia julibrissin is quite common in public spaces as well as in home gardens. 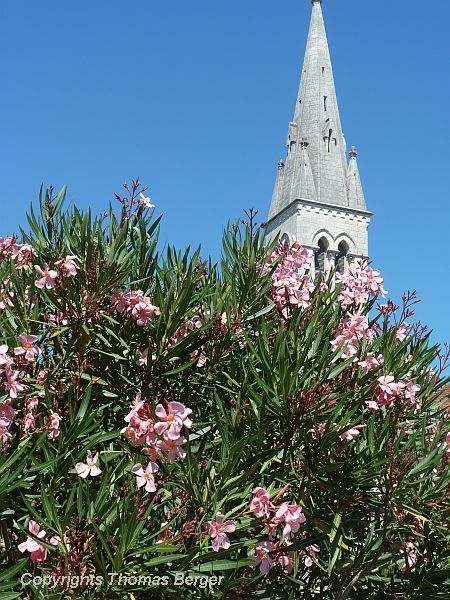 Oleander, a poisonous evergreen shrub with beautiful flowers, is found in many ornamental plantings. It easily survives the mild coastal winters of the region. Sycamore is one of the most common street trees. The wide open crown casts a pleasant shade of olive-green tinted light, and the mottled bark adds to the whimsy. Agapanthus impresses with blue flowers and bold foliage. Landscaping enterprises frequently offer specimen trees such as these mature olive trees for sale. With their stately appearance and the exotic atmosphere they create, palm trees appear in every upscale planting, and rightly so. The city of Bayonne greets arriving visitors with a vibrant floral display containing various shades of yellow. We appreciated the entrance greatly - of course we were on bicycles, and those rushing by in a car will barely see it. Quite often we passed by beautiful vegetable gardens that must have provided fresh ingredients for creations of excellent French cuisine. All vegetable gardens had a great variety of plants, including bush and climbing beans, kales and cabbages, cucumbers, pumpkins, melons and zucchini, as well as tomatoes, lattices of various sorts, and an occasional fruit tree. The sandy soils here are very suitable for asparagus cultivation, as seen here on the right. This field is quite large and irrigated with a sprinkler. Passionflower (Passiflora) is frequently found growing on fences. I am guessing they served the dual purpose of ornament and occasional snack. Fruit trees, especially peaches, nectarines, plums, and apricots are quite common. 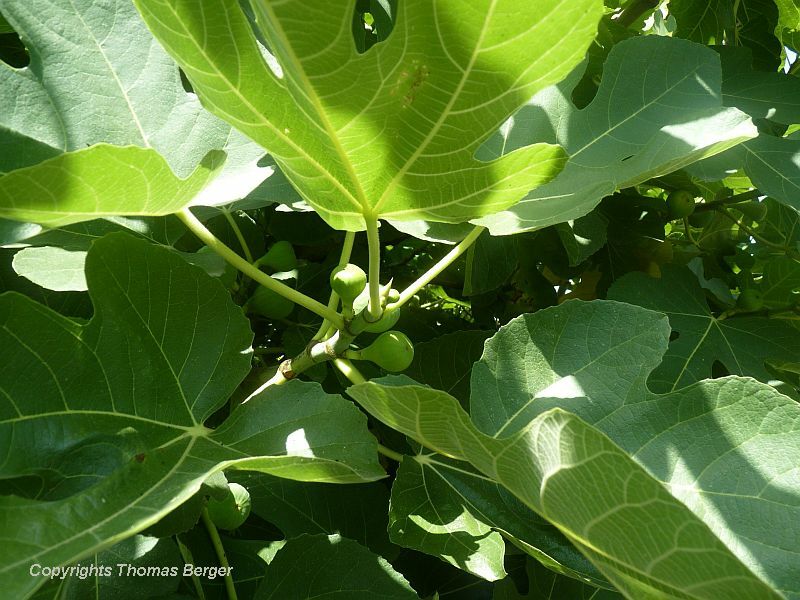 Fig trees (above) are found in many gardens and sometimes even growing in the wild. Olive trees can also grow in this region, but are more often used for ornamental purposes than for fruit production. The growing conditions are perfect for Bamboo, as is evident from the size and abundance of bamboo groves. They were often along road sides where they were clearly escapees, if not invasives. In Spain, the style of the houses was slightly more rustic and perhaps less elegant, but in turn more playful and at least as charming as in the French part of the Basque region. These romantic balconies were overlooking a narrow street in Hondarribia. And here they are - Geraniums on the balcony! A modern pool constructed with elements of ancient classical architecture invites passers-by to enjoy a refreshing splash in the water. Benches under trees allow for a break in the shade. The whole city is sprinkled with small parks and public places. I was very impressed with this kind of urban planning, which seems to serve the common good very well. This beautiful shrub was quite common in ornamental plantings. It is Crape Myrtle (Lagerstroemia), which we New Englanders never get to see without traveling to milder climates. The Chaste Tree (Vitex agnus-castus) is frequently planted in gardens and parks. It attracts butterflies with its blue flowers and fine fragrance. The shoots are traditionally used for weaving baskets, and the plant also has a number of medicinal uses.